This Article discusses the unparalleled economic, legal, and political change that has confronted China during WTO accession. The Article focuses on the relationship between China's unique WTO accession process and China's reform over the past two decades. The author suggests that WTO accession has acted as a lever for economic and legal reform by locking in reform and making it irrevocable. The Article begins with a historical background of China's long road to accession and the way that this process worked to further the previously instated economic reform program. 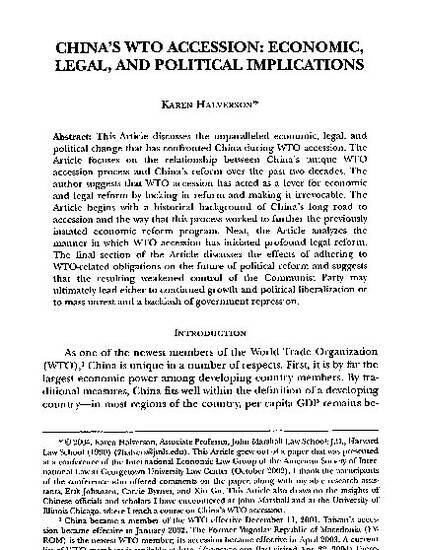 Next, the Article analyzes the manner in which WTO accession has initiated profound legal reform. The final section of the Article discusses the effects of adhering to WTO-related obligations on the future of political reform and suggests that the resulting weakened control of the Communist Party may ultimately lead either to continued growth and political liberalization or to mass unrest and a backlash of government repression.